Well....a very simple formula.....if India beat New Zealand in the three-match series than Pakistan will become number T20 side! I thought you are joking but then I checked ICC rankings and you are right! 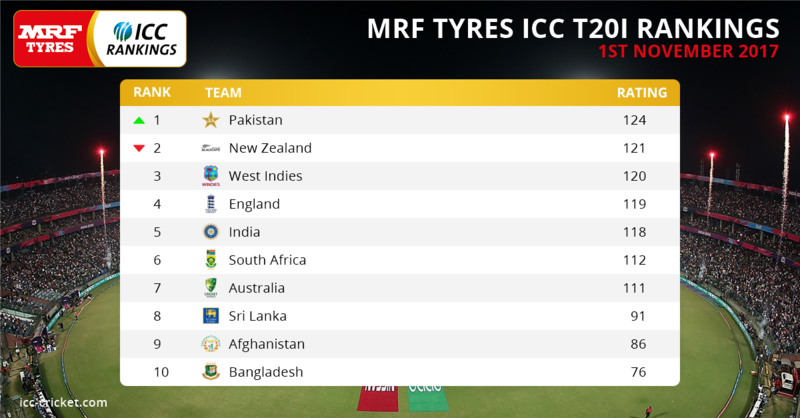 Imran beat New Zealand in first T20 yesterday and now Pakistan has become number 1 T20 team. So NZL lost one match and they lose 4 points? Isn't losing 4 points after one match is a little too much? (11-02-2017, 02:19 PM) ridak Wrote: So NZL lost one match and they lose 4 points? Isn't losing 4 points after one match is a little too much? It happened because T20 is a new format and teams haven't played much matches (like ODI and Tests) against each other hence rating is fluctuating. Quote: The Elo rating system is a method for calculating the relative skill levels of players in competitor-versus-competitor games. A player's Elo rating is represented by a number which increases or decreases depending on the outcome of games between rated players. After every game, the winning player takes points from the losing one. The difference between the ratings of the winner and loser determines the total number of points gained or lost after a game. In a series of games between a high-rated player and a low-rated player, the high-rated player is expected to score more wins. If the high-rated player wins, then only a few rating points will be taken from the low-rated player. However, if the lower rated player scores an upset win, many rating points will be transferred. The lower rated player will also gain a few points from the higher rated player in the event of a draw. This means that this rating system is self-correcting. A player whose rating is too low should, in the long run, do better than the rating system predicts, and thus gain rating points until the rating reflects their true playing strength. Now that we understand how this rating system works, let's take a practical example. Both New Zealand and Indian teams are considered 'close' so the points earned are opponent + 50 points for the winner and opponent - 50 points for the loser. It means aÂ win is worth 50, and the relative strength 9.3. In other words the win itself affects India's rating by 50/23 = 2.2 points, and the relative strength adds an extra 9.3/23 = 0.4 points. For New Zealand, the loss itself lowers their rating by 50/14 = 3.6 points, and the relative strength is worth an extra 9.3/14 = 0.7 points. As you can see the relative weight of each match is actually 23 /14 = 65% more for NZ. 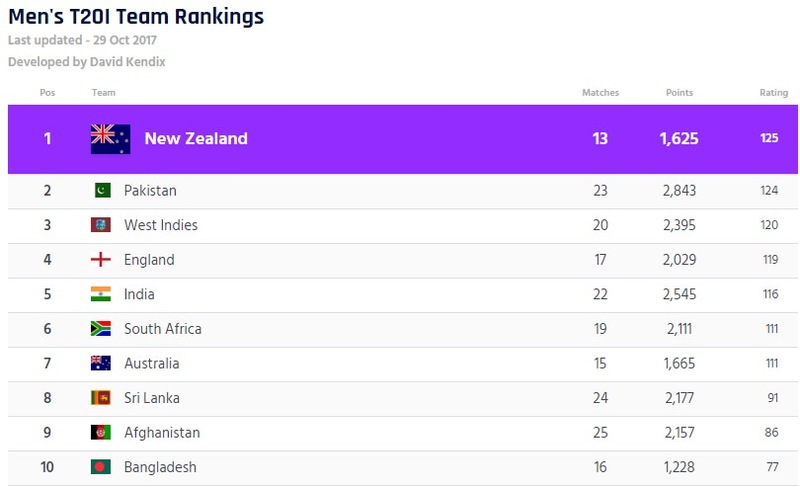 That's because Pakistan have played far more games than NZ.Â So the really significant factor is actually the small number of games that NZ have played. The extent to which an individual match moves the score is therefore most highly dependent on the number of matches the team has played. On the other handÂ the ODI championship is based on around 50Â matches, so a loss to an equal-ranked team moves only around 1 point, at 25 it's around 2 points, and with 13 teams it's almost 4 points. Good explanation. It means NZ won't lose 4 points for each match because as they number of matches will increase point deduction will decrease. Then we also have to consider the points for winning team. As both teams approach similar points, points increase will also slow down.